In two years you will be getting the Olympics. If you choose to embrace them, you have no idea how sweet they are going to be! During the games, you will feel like you are hemorrhaging money. You will be shocked at how much you spend but you won’t care because you will feel like you’re on vacation in your own city. Not just “you”, but everyone, on the same vacation, in the same place, and you’re all best friends. Every night you will have 20 different places to go and you’ll have friends at all of them. You’ll feel like you need to seize each moment, see everything, do everything, be everywhere. It’s exhausting. You won’t sleep. You’ll love it. Vancouver prides itself on being a multi-cultural and diverse city (sound familiar?) but sometimes, that hurts it. There are so many different groups of people that have little in common with one another and often that keeps them distant and separate. For 2 weeks, all of that suddenly changed. Everyone felt as if they were of the same tribe. We all felt as one. I cannot count how many sincere hugs and high-5’s I have exchanged with complete strangers. Every human being should feel what that’s like. It’s empowering. People will talk about an “Olympic Legacy”, something that remains with the city after the games are gone. It’s not a speed-skating oval or a new rapid transit line. It’s the incredible sense of unity that a populace feels when they know that they are all a part of something genuinely great, together. You will witness moments of greatness that will go down in national history. I ran into a guy outside the stadium yesterday who had just bought a single scalped ticket to the game for $1800. He said he had put aside two thousand since the summer with the intention of spending it on this one gold-medal hockey game. Considering the outcome, he got the bargain of the century. You will witness moments of ridiculousness: The mayor of Vancouver came onstage just before the free Damien Marley concert and proclaimed February 24th “Canadian National Snowboarding Day”. What!!?? That’s Olympic fever for you. You will witness moments of cool gone wrong: My brother got busted for ginching a micky and kicked out of the free Girltalk concert 2 days later. You will find yourself caring about obscure sports like the Skeleton or the Biathelon and discussing the finer strategy of these events with your friends. You will fall in love with the athletes because they are real people. They are not prima-donna millionaires who play for massive sports clubs (for the most part), they are regular folk, many of whom have regular jobs, who have trained for years doing some little-known solo sport and are sincerely trying their absolute best to make their country proud. You will relate to these people. You’ll feel their pain and their joy. It’s catharsis. Foreign medias may criticize your Olympics, saying the venues are poorly prepared, infrastructure is ill-organized, the competitions lack drama or style. What they fail to realize is that the Olympics are not about sports. 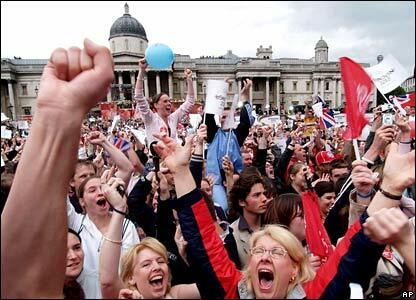 They are about spilling out into the streets and cheering as one, feeling something as one. The sports themselves are just an excuse to cheer. They are merely a vehicle to unite the masses into one common and singular passion. You cannot possibly realize that unless you step out onto the streets and feel it for yourself. People will denounce your Olympics by telling you that $6 billion dollars (estimate of what ours cost) for a 2 week long party isn’t worth it…..but…..what if it is? My city has never felt better. This entry was posted on March 1, 2010 at 10:28 am and is filed under soirees, sports. You can follow any responses to this entry through the RSS 2.0 feed. You can leave a response, or trackback from your own site. Hi Allen, Great blog and I love the hat! 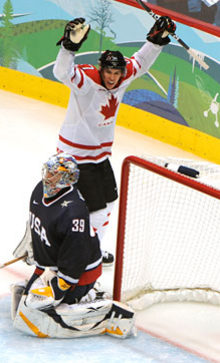 Watching the Olympic games on TV has made me so homesick. Vancouver rates as “Extremely Cool” here Down Under. Australian commentators are raving over the best games ever and the athletes love that the crowds cheer for every competitor. love, Joni PS See you in August! PPS I want some of those red mittens! Here in the UK, the media have all eaten crow about their smacktalk. 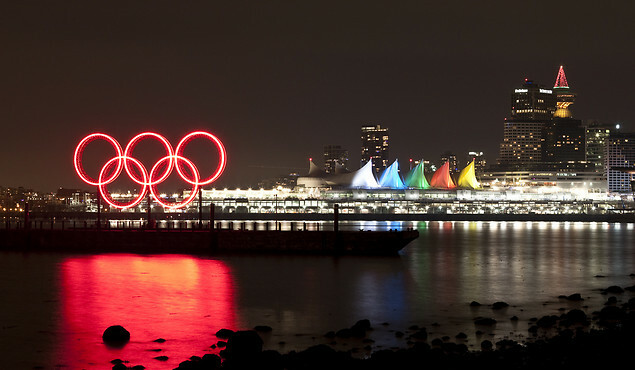 They’re now fretting that their games won’t live up to the awesomeness of Vancity’s Olympics. But, I’m gonna give them a hand in turning the party out Vancouver-style. We’ve got two years to practice.